Portugal was one of my most surprising drawing experiences. I was fascinated by the fact that this country (at least the architecture) seemed to be a two-tone land: brown from stone and white from lime on the walls. Unusually, I had taken with me a notebook with brown pages. So, rather than allowing empty spaces on my sheet of watercolor paper to figure the white walls as I would have normally done, I decided to reverse things. I bought a tube of white gouache and loved playing in dual tone. 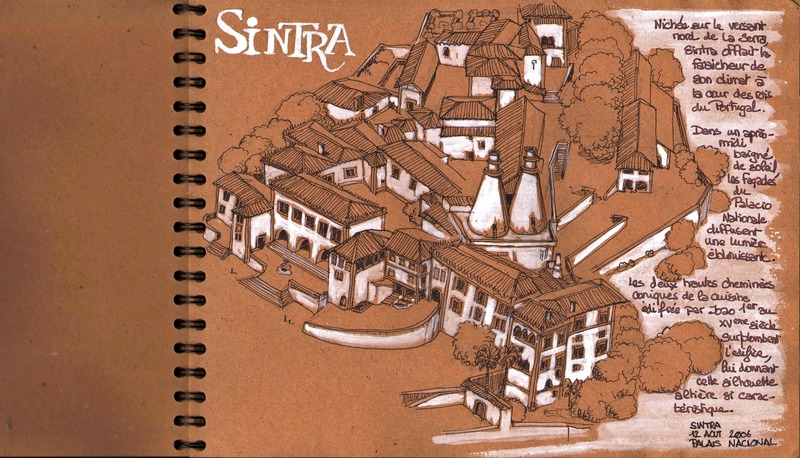 This entry was posted in Brown & White, Portugal and tagged Carnet de voyage, Drawing, illustration, Palacio Nacional, Portugal, Sintra, Travel Sketch by flinflins. Bookmark the permalink.